They've worked this hard to climb up the standings and want to keep that momentum moving in the right direction. 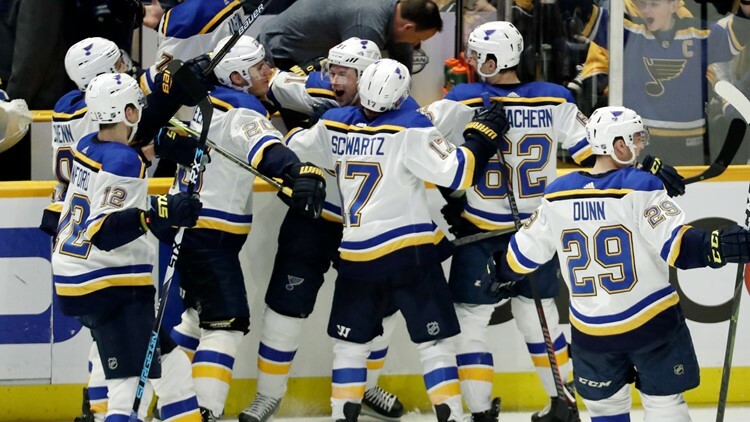 ST. LOUIS — Riding a six-game winning streak has been quite the feat thus far for the Blues, and doing so the past three games against two of the toughest teams in the league (Tampa Bay and Nashville twice) were some of the more emotionally draining kind of games packed with playoff intensity. Now, it's on to the New Jersey Devils for the Blues (27-22-5), who want to keep riding this wave of emotion but will have to do so against a team below .500 (21-26-8) but one that can be deceptively good. The Blues host the Devils today at 7 p.m. (FS-MW, KMOX 1120-AM) in a quick one-game at home before leaving for another three-game trip in a game that can be classified as a letdown game. But the Blues, who currently hold down the first wild card in the Western Conference and sit two points behind Dallas for third in the Central Division, have no time to take off. "We know where each team is in the standings, but I think that's our job to make sure we come out with our best game," Blues defenseman Colton Parayko said. "However you want to prepare, just come out with the same attitude. Where we're at in the season, where we're at in the playoff standings, games just don't come easy right now, so points are tough. I think as a group we collectively understand that and I think we understand that points aren't coming easy and we're going to have to put our best foot forward no matter who it is." The Blues, who are 10-2-1 the past 13 games and have held 10 of those opponents to two goals or fewer, are in no position to take time off. They've worked this hard to climb up the standings and want to keep that momentum moving in the right direction. That's what they've been able to do during this winning streak. They have a chance to go for seven in a row, which would be the longest since winning seven Jan. 17-Feb. 5, 2015. "We've been playing full 60-minute games," Parayko said. "There are times when you have lapses and stuff, but we've been doing a good job of sticking with it when we're in those situations. When you continue to pressure and continue to stick with it, it makes it tougher for teams to start generating momentum and start generating things." Rest assured, the coaching staff addressed the situation. "It's not about being careful," Blues interim coach Craig Berube said. "We've got to take them like any other team. We talked about it this morning. You have to approach the game like you approach playing Nashville. They're a good team, they've run into some tough luck this year, they're a competitive team, they skate well, they're going to get after us, if we're not ready, it's going to be a tough night for us. It's on each individual to make sure he prepares himself to play the right way from the get-go." The end to the Blues' 5-4 win against the Predators was the outcome the Blues wanted, but Nashville center Ryan Johansen didn't think it came on level playing ground. Blues center Ryan O'Reilly won the opening faceoff, and Vladimir Tarasenko capped his fourth regular-season hat trick by scoring 16 seconds into the OT and the Predators never saw the puck. Johansen said after the game that he felt the wasn't ready for the faceoff and didn't get a fair attempt when referee Chris Schlenker dropped the puck for the start of OT. "I thought it was a very unfair drop at the end of the game," Johansen said. "He drops the puck and my stick's not down and he's skating away like it doesn't matter. It totally impacts the game. We saw it with our game with Dallas where we win the faceoff and we can win the game. That possession to start is huge. That's all that matters. We played our butts off and they played their butts off. It came down to a mistake like that, and that should be addressed because that's not fair. O'Reilly's an unbelievable faceoff guy and I just want it to be fair. It's too bad it ended like that. "My stick wasn't even on the ice." O'Reilly, who took 39 draws in the game and won 22 of them (the most faceoffs he's had in a game since taking 42 on Feb. 13, 2018 against the Lightning as a member of the Buffalo Sabres) was asked about it Tuesday morning and defended Schlenker. "Obviously I heard [Johansen] complain right after the draw, but the ref said, 'Put your stick down.' He was waiting for it," O'Reilly said. "I was there and I was set and I was waiting. He took too long I guess. I think for the refs, it's different and they're not as consistent as the linesmen are. Obviously they have a lot of other stuff to do, but it's a fortunate bounce for us. To win the draw, get possession and score, it played an impact in the game and we're lucky to be on the right side of it." Johansen could be seen skating towards Schlenker after the game ended to get some sort of explanation. "I don't know what the explanation for it exactly was," O'Reilly said. "I felt he was just waiting. He wasn't putting his stick down and I was ready. Lucky for me we got a good bounce and we won the game. "He dropped it and then [Johansen] was complaining and he just said, 'You didn't put your stick down' kind of thing. I think the timing was just off there. The center ice draws are always different. The refs are not used to taking them a lot. The timing isn't right and it's different. It's a unique play for sure." The Blues are going back to Jordan Binnington in goal tonight. Binnington, who was named the NHL's First Star of the Week Monday after going 3-0-0 with a 1.31 goals-against average, .954 save percentage and one shutout, is 5-0-0 with a 1.38 GAA, .942 save percentage and one shutout his past five starts, and 9-1-1 with a 1.54 GAA, .939 save percentage and two shutouts his first 11 NHL starts. Binnington can become the second goalie in Blues history with a winning streak of at least six games (Brent Johnson, seven straight, accomplished it twice, Oct. 6-Nov. 18, 2000 and Nov. 29, 2000-Jan. 1, 2001). "I'm not really thinking about it," Binnington said. "I'm kind of going day by day and trying to be relentless. It's really tough. You've got to come in every day and work really nonstop. You don't have time to think. I'm excited to be here. I wouldn't say I'm surprised, but I'm definitely enjoying it. "You just try to prepare for anything, right? It's just been a fortunate situation with the team winning games right now. We're all excited and it's been fun. It's a lot of games, a lot of action, but you get a lot of rest and that's what I'm learning along the way." Binnington had started seven straight games before Jake Allen played Sunday in Nashville for the first time in 24 days (Jan. 17 at Boston). Binnington's calm demeanor has seemed to spur the Blues in the right direction with his no nonsense attitude. "I've kind of been act like you've done it before kind of guy," Binnington said. "I've been here for six, seven years now. I'm comfortable and I'm kind of hoping I'm getting the team going and keeping us in the right direction." It's been quite the whirlwind month for Blues rookie Mackenzie MacEachern. MacEachern, who's played in 11 games (two goals, one assist), was worried after he got a call to come into the office of head athletic trainer Ray Barile to speak with director of hockey operations Ryan Miller. But that worry turned to smiles Saturday after the Blues beat the Predators 3-2. MacEachern was being called into sign his one-year, one-way contract extension worth $750,000. "I was notified after the game," MacEachern said. "Ryan Miller told me to come in and meet him in Ray's office, so I was kind of confused to what's going on. Obviously it was a nice surprise that they were giving me an extension and just to sign it on the spot right there. "It's awesome. To get that extension's awesome. Good group of guys here. Obviously you can see what this team can do right now. We're on a bit of a hot streak and really excited about the group. It's awesome to play. Just take it day by day. You don't want to get complacent obviously now that I have security. I just want to go out each and every day now and play my game." MacEachern was set to become a Group VI unrestricted free agent and the Blues saw enough in the small sample size not to get it get to that point. MacEachern will now be a restricted free agent after the 2019-20 season but thought he was still going back to San Antonio of the American Hockey League after the game Saturday. "I knew [David] Perron was coming back, so I just kind of figured it's numbers and oh well, it was kind of a good run," MacEachern said. "But obviously it was a nice little surprise there." Former Blues farmhand Kenny Agostino will make his Devils debut tonight after being claimed off waivers on Monday from Montreal. Agostino, who played seven games with the Blues in the 2016-17 season and scored a goal with two assists after signing as a free agent, remembers his time here and some of the Blues players he played with while a member of the Chicago Wolves. "I do remember my cup of coffee here," Agostino joked. "Obviously here was great too. A lot of familiar faces on the other side. Coach I had in Chicago and some players. "I think I've become more of a two-way, defensively responsible hockey player. I sort of learned and adapted to playing a bottom six role in this league better over the years." Tarasenko has 12 points (seven goals, five assists) in an eight-game point streak, which matches an NHL career-high. A point tonight would set a career-high. O’Reilly has 13 points (four goals, nine assists) the past 11 games and 23 points (seven goals, 16 assists) the past 20 games. Forward Brayden Schenn has seven points (one goal, six assists) the past six games. That line of Schenn-O'Reilly-Tarasenko has 23 points (nine goals, 14 assists) the past six games. Defenseman Carl Gunnarsson (upper body) skated Tuesday but will miss his fourth straight game. Perron, who has missed the past eight games with an upper-body injury, will be re-evaluated this afternoon but will not play. He did not skate Tuesday with the group. "He's still day to day right now," Berube said. "We'll know more today on him. He's getting looked at and evaluated today." Healthy scratches include Robby Fabbri and Chris Butler. David Perron(upper body) and Carl Gunnarsson (upper body) are out. Keith Kinkaid will start in goal; Cory Schneider will be the backup. Healthy scratches include Steven Santini, Drew Stafford and Nick Lappin. Taylor Hall (lower body), Sami Vatanen (concussion), Stefan Noesen (lower body) and Miles Wood (upper body) are out.